Nature’s butter (well, that’s what I call avocado) has been staring me in the face for the last week. You see, just by chance I was gifted a couple of avocados a week ago by a nice woman. I was reminded that it was the beginning of avocado season. I was very excited. I thought they would have ripened during the week-end; but, they didn’t. I placed them on my counter in a brown bag so as to hasten the ripening process. What do you know? It took those ‘guys’ exactly one week to ripe. I’m not complaining though. I was super-happy because I was in the mood for a home-made lunch. And when I made a check on them, they were ready for me. I immediately rinsed and sliced my way into the beautiful yellow flesh of one of nature’s butter. From the looks of it, it was perfectly ripened to my liking, firm but possessed the silky smooth touch. I couldn’t wait to dig in. I proceeded to thinly slice and season with a pinch of salt and pepper, and a squeeze of lime. In addition, I added another favorite of mine, vine-ripe tomatoes. Though they were matured and juicy, they also were firm and sweet. I seasoned in similar fashion as the avocado slices. And, I drizzled a little olive oil on same along with crumbled pepper jack cheese with jalapeno. My avocado and tomato salad needed more accompaniments. So, I reached for a couple of eggs and poached them to a soft finish for approximately 5 minutes with slightly runny yolks. I made sure to drizzle a little house vinegar in order to readily set the white of the eggs. Eggs were drained on paper towel and then drizzled with olive oil and a sprinkle of salt and black pepper to my taste. 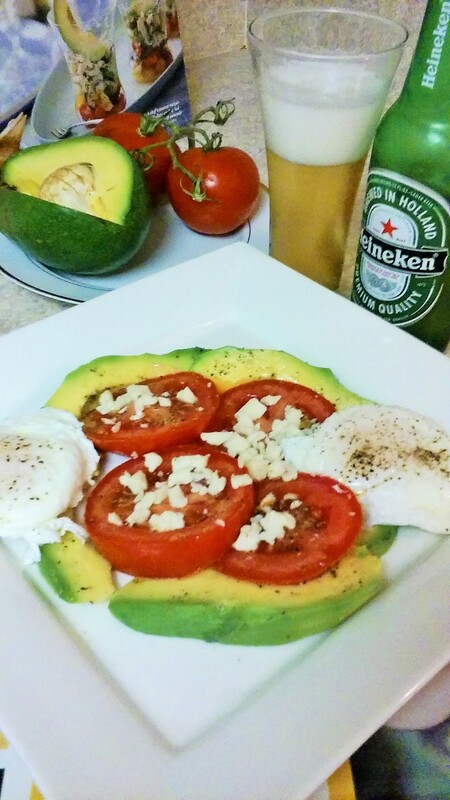 Guys, my avocado and tomato salad was not complete without a pairing of Heineken beer to quench my thirst. Moreover, on the side, I served toasted whole-grain English muffin (not in pic) with butter. I was ecstatic. Please stop teasing me with avocados am barely getting any since the season started. I’m sorry. It wasn’t intentional. I can’t promise though.lol! Have a beautiful summer.